The new addition to the Exilim family of digital cameras sports a 2.7inch LCD screen that is 3x brighter thanon previous Exilim cameras and six megapixel resolution. Casio Electronics Ltd, in conjunction with its parent company Casio Computer Cc., Ltd. announced the release of the latest addition to its Exilim Zoom digital camera series with the EX-Z600. The latest evolution in this popular series offers 6.0 megapixel high resolution photos in a stylish, compact, and pocket-sized package. The extra large 2.7 inch Super Bright LCD is approximately three times brighter than the previous EX-Z500 model, producing an impressive luminance of 1200 candelas per square metre. This significant advancement makes the LCD easier to see, especially when viewed in the sunny outdoors. In auto mode, the LCD automatically adjusts to the brightness of the surrounding environment. The EX-Z600s Super Life Battery now has an even longer battery life, supporting a staggering 550 shots per charge*. 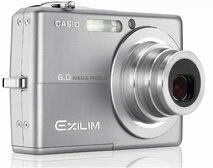 The Exilim line is a culmination of Casios core technologies of miniaturization and digital technology resulting in a smaller, higher resolution camera - the established trend leader in stylish, quick responding, large LCD, and long battery life digital cameras. The EX-Z600 includes the latest version of the Exilim Engine, featuring the Anti Shake DSP, which along with the Auto Macro and Quick Shutter functions, considerably reduces the incidence of blurred photos due to moving subjects or shaking hands. New to the EX-Z600 is the Rapid Flash function, which enables three consecutive high speed flash photos in only one second, allowing you to completely capture the moment without losing precious seconds between shots. The EX-Z600 includes Revive Shot, used to take still images from old album photos for long term preservation and enjoyment. Revive Shot digitally revives faded colours and automatically adjusts for obliquity, even when photos are shot while still in the album. The EX-Z600 is equipped with a Bestshot Button, allowing convenient one-touch access to this popular feature that offers 32 different scene selections, including Anti Shake and Revive Shot, for hassle-free photos every time. The EX-Z600 embodies Casios continuing commitment to offer digital camera users cutting-edge technology and convenient user-friendly functionality in a small, stylishly designed package. Providing the freedom to take high quality pictures and movies anywhere, anytime, the new EX-Z600 makes taking memories as easy and fun as making them. The EX-Z600 will be available in the UK from March 2006 in silver, black and blue from all good digital camera retailers.